One of the great side dishes to the aural feast that is the National Association of Music Merchants (NAMM) show is all the gigs that take place during the week in Southern California. Musicians and industry types descend on Orange County by the thousands for the enormous four day tradeshow. Many artists hope to pick up a paying gig or two while they are in town. Others hope to check out or even sit in with a kindred spirit on stage. When you are at a jazz or blues club, one often hears patrons say, “I heard so and so might stop by to jam.” These kind of “impromptu” musical unions don’t often materialize. During NAMM week they often do. impresario Terence Love. Love, who has been booking real jazz in this north O.C. location since 1994, is a hands on operator who also serves as the club’s master of ceremonies. Joey D’s Friday night gig, the last of his two night stand at Steamers, was special. As is always the case, when the greatest B3 player of his generation is on stage, the tiny night spot is packed. Joey, who will turn forty this April, had in his audience both his parents and his brother. Joey’s Dad, “Papa” John DeFrancesco, is an accomplished jazz musician who would play the organ the following night at the club. Guitarist John DeFrancesco would join his famous brother on stage during the keyboardist’s first set. The Joey DeFrancesco trio on this evening consisted of long time musical colleague Byron “Wookie” Landham on drums and veteran, L.A. based, seven string guitarist Ron Escheté. The entire room, it seemed, was made up of musicians and industry types who make their way to Steamers each year to hear the great Joey D. The early arriving crowd, who came from all over the musical landscape visited with one another, connected with old friends and met new ones. As the set began the crowd settled into the groove. Joey and his fellow musicians stretched out and showed off some impressive chops before settling into a series of Blues, Ballads and Standards which laid the foundation for some first rate improvisation and interplay. Towards the end of the set Joey invited his brother to take over the guitar seat from Ron Escheté for a couple of numbers. John DeFrancesco’s edgier sound contrasted nicely with the beautiful more melodic lines and phrases Escheté had delivered up to that point. Terence Love announced there would be a brief intermission. He also urged patrons to “Stick around.” He assured the audience that there would be some surprise guests in the second set. There were. After the first number of the second set, Joey brought up to the stage two gentlemen who had been sitting together in the corner all evening to join him. The great trumpet player, Arturo Sandoval and a vocalist, who Joey D introduced with a crooked smile simply as Joe, made their way through the crowd and onto the stage. distinctive New Jersey accent, “Howyadoin?” For the record, I was doing great. I had never met Joe Pesci and I didn’t know he would be singing some tunes with the band from the great American songbook in the second set. Joe P’s association with Joey D goes way back. Pesci under the pseudonym, Joe Doggs was featured on DeFrancesco’s 2003 Concord Records release Falling in Love Again. The famous actor engaged the musicians on the patio in conversation. He knew every one of the players by first name and spoke in their language. So when Joe sang with a musical sensibility that had more to do with jazz than say, pop vocal stylings, I wasn’t surprised. The arrangements left plenty of room for solos by Joey D and Escheté, as well as some intense soaring lines from Sandoval. After Joe finished singing a very bluesy version of On Broadway, he left the stage to the instrumentalists. At this point in the evening Arturo Sandoval was given room to really stretch out. The audience and his fellow musicians were in awe of his virtuosity. Ramon Banda of the Banda Brothers Band closed the set on drums. 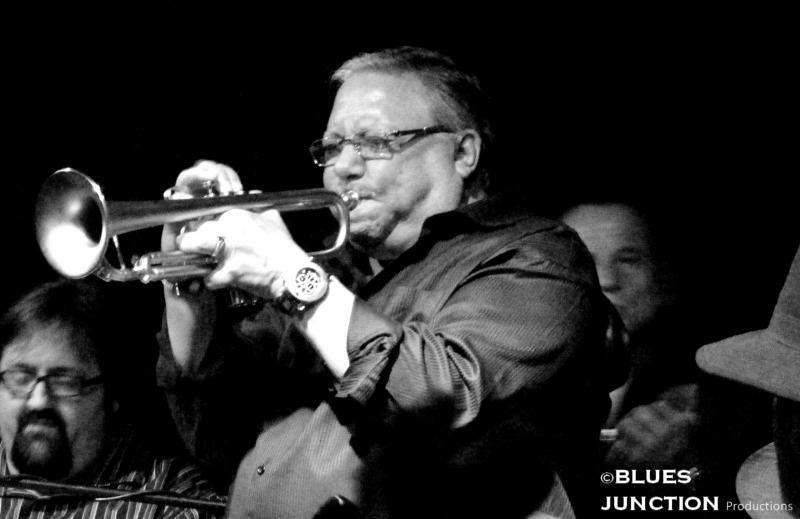 Two of the most celebrated jazz musicians of this or any era, Joey DeFrancesco and Arturo Sandoval created high art in the moment and in public. They did it with several other very talented musicians, who dare I say, all seemed like some very good fellas. Bada Bing….. Note: Joey Defransesco played a Key B Duo. For more info on this instrument see the links page on this site.